Coming soon: IPP will have a full line of Aluminum Nitride Resistor and Terminations products. 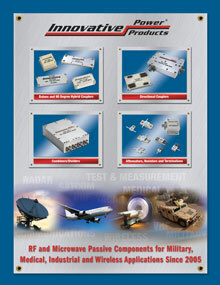 Innovative Power Products, Inc. has over 30 years of experience designing and manufacturing RF and Microwave Passive Components. Our high power, broadband couplers, combiners, resistors, terminations and attenuators are fabricated using the latest materials and design tools available, resulting in unrivaled product performance. Our ISO 9001:2015 registered quality system assures our customers of a reliable product for their application. Innovative Power Products’ broadband products are used around the world in RF and Microwave applications in military, medical, industrial and commercial markets. Innovative Power Products, Inc. is quickly becoming a market leader by offering our customers competitive prices, fast delivery worldwide and outstanding customer service. All of the products listed on our web site link to detailed mechanical drawings that contain electrical specifications as well as performance data and S-Parameters when available. Please contact us by phone at 631-563-0088, e-mail or by filling out the form on our website. We can design and manufacture custom products to suit your individual needs. If you cannot find a product that meets your requirements, please contact one of our design engineers with your specifications and we will work with you to develop a solution for your application. Thank you for considering Innovative Power Products, Inc. as your supplier for RF and Microwave Passive components. Given the opportunity, we will do our best to impress you with our product performance and customer service. See for yourself why so many companies turn to us for superior passive components. Call 631-563-0088 to speak to an experienced Design Engineer about your upcoming project. Product samples are available for many of our products. Submit a Sample Request to help with your project development. Our new product catalog is available online.